On May 28-31, SAI carried out workshops in Belgrade and Kapaonik, Serbia for the World Bank's International Finance Corporation (IFC). These comprised the first field visit to pilot the Environmental and Social Management Systems (ESMS) Handbook and Toolkit that SAI has developed for the IFC. The ESMS Handbook and Toolkit is designed as a user-friendly guide to help companies to develop and implement management systems for environmental and social performance, in accordance with the IFC Performance Standards 1-8. Key performance areas include: 1) environment; 2) labor; 3) community; and 4) occupational health & safety. This Handbook and Toolkit focuses on the Food and Beverage sector; SAI and IFC have plans for 14 more in other sectors. In Serbia, IFC staff and its selected local consultants were joined by SAI: Jane Hwang, Director of Corporate Programs & Training; Craig Moss, Executive Advisor, Corporate Programs & Training; and Yogendra Chaudhry, SAI Environmental Expert and Lead Trainer. On May 28, SAI and IFC HQ staff from US and France led a TOT (train the trainer) for IFC regional staff and consultants from Serbia, Macedonia and Ukraine. The purpose was for IFC staff and consultant to understand the hands-on use of the Handbook and Toolkit building the capacity of companies to measure and improve. 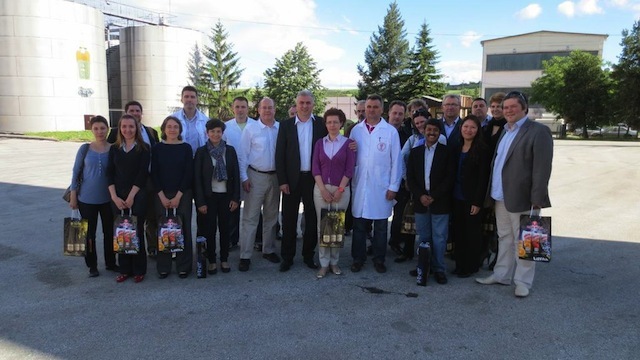 On May 29-30, the team visited the Vino Zupa plant, an IFC investee company in Kapaonik. The TOT and plant visits also provided opportunities to elicit feedback on ways to improve the Handbook and Toolkit. "The ESMS toolkit training and pilot implementation has been a good learning experience," said Mr. Chaudhry. "This was a perfect opportunity for SAI to test run the utility of the handbook. The local consultants and the IFC experts were a great team to work with." "As part of the program, specific areas were identified and targeted for improvement," said Mr. Moss. "An improvement plan will take place in the next month to help them prioritize which risks to address." SAI extends it thanks to Vino Zupa for being the first to volunteer for this field visit, and for their transparency and commitment throughout the process. Next, SAI and IFC expect to extend the pilot to Peru and to develop 14 more editions for other sectors.